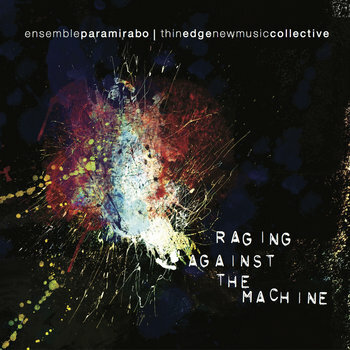 Raging Against the Machine is a collaborative project featuring Montreal-based Ensemble Paramirabo and Toronto-based Thin Edge New Music Collective. Inspired by the driving rhythmic nature of Steve Reich’s Pulitzer prize winning Double Sextet and Louis Andriessen’s Workers Union, this project was the impetus behind the creation of three fascinating Canadian works: Hum for double sextet by Brian Harman (Toronto/Montreal), Fog by Anna Höstman(Toronto) and Le Sel de la Terre by Patrick Giguère (Montreal). RATM aims to establish meaningful connections between artists with distinct geographical, cultural and linguistic identities. Ensemble Paramirabo and Thin Edge New Music Collective would like to thank the Canada Council for the Arts and the Ontario Arts Council for their generous support of this recording. Special thanks to Arraymusic, David Jaeger, Dennis Patterson, Stéphane Tremblay, Roger Moore, Jordan Nobles, Conseil des arts et des lettres du Québec, Toronto Arts Council, SOCAN Foundation, The Music Gallery, New Music Edmonton, Music on Main/The Little Chamber Music Series That Could, Open Space Victoria.